Just like our 38Ft Mustang was only able to carry 9 people yet my 19Ft Bow rider can carry 7.
or a Maybe the tide is a bit fast for the jig, put a ball sinker on the nose or a short distance from it as you may not be getting deep enough to raise any interest. Cheers mate. I averaged about 50km/hr there and also averaged about 50km/hr on the way back!!! But by far the best part of the day was having the traps all to ourselves. Not a boat in sight for milessssss Cheers big Neil. Thanks Baz. They will be heading your way soon and will be bigger by the time they get there! You could try along Hasting river drive. There is a rowing club behind the football fields that has good/easy access. Further down the road past the whalebone restaurant is also worth a look. Hi Tony, Im thinking it could be a Piedtip Cucumberfish "Paraulopus okamurai" Also I wouldn't know where to start if it wasn't for you suggestion. Thanks. Sorry Zoran I seem to have forgotten to reply to this. That's pretty good fuel consumption for a 200HP ! I dont have an exact measurement but that day we did botany to browns and then south east browns and then the peak. So I'd say circa 100km. No problem @kingie chaserhope you get some. @LuckyFil it sure is hard to get up when it’s that early, but you definitely reap the rewards later. Thanks Scratchie. I actually cant wait. I might have a go for tuna this winter season but again lots to learn first!!! I heard theres a bloke named Jeff who's the fish whisperer who lives up port way. I should swing by for lessons ! Cheers wazza ! Put one of the mahi in the oven and some flathead fillets for dinner. Same day caught. Just cant compare 👌 Cheers Zoran ! 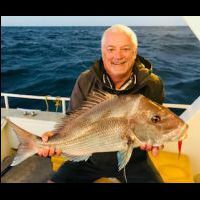 Dad has been patient hes not keen on 9 hrs sitting and trolling so hes missed out on most of the beakie trips but luckily he can get out during the week being retired. He prefers to go with me though ! Loading and offloading the 6.2m plate boat can be tough at 70 years . Well done- some great eating there! How do you lose the wire? bitten off? Why not use gang hooks? Im sure most dont use wire for tailors and never have an issue with being bitten off. Just checked, the Australian builders plate on the boat says 5. All good, cheers!